The crazy is possible, and the scramble is on. Ron Paul’s inevitable penetration into America’s political consciousness is frightening both sides of the aisle. 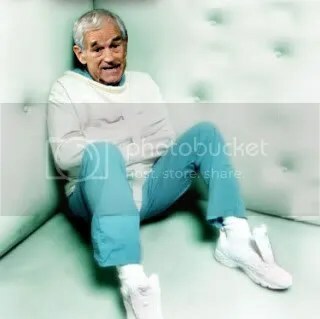 The Ron Paul brand is a weird assemblage, attracting seemingly disparate bits of our societal frustration. anti-war refugees and those criminalized by the drug war like some of what they hear. Anti-government libertarians and critics of America’s death-pact with Israel like some of what they hear. And, some would argue, corporations, racists, and anti-semites like some of what they hear as well. Dave Lindorff, one of my favorite regulars at Counterpunch, has a piece up today, titled Why the Establishment is Terrified of Ron Paul. Libertarianism is at its core an ugly anti-social philosophy of selfishness carried to the extreme. It is the antithesis of all that has been good in human social evolution — the creation of philosophies of caring and of societies in which suffering and want are addressed and, where possible, ameliorated. Interestingly though, Paul is not being pilloried by his establishment critics in the GOP or the Democratic Party, or in the media, for his Libertarian economic theories or even his far-out property-rights theories. These are, after all, also quietly shared by most people in both of the major parties, and of course are wildly popular among the ranks of the corporate elite, who know they can always get all the favors they want or need from politicians by buying them, and who are happy to spout the gospel of Ayn Rand and Milton Friedman when it comes to government regulation of their businesses or taxation of their personal hoards. Unfettered capitalism is also an article of faith in the corporate media. That said, sometimes it all comes down to a couple of big issues, and in the unlikely chance that the election next November were to end up being the choice between Barack Obama and Ron Paul (and assuming no emergence of a viable Third Party progressive candidate like Rocky Anderson and hisJustice Party), while I might have a hard time pulling the lever for Paul unless he can really make it clear he has no truck with White Supremecists and their ilk, it would be easier than pulling a lever for Obama. Why? Because with President Obama we would get more war, increased military spending, and at the rate he’s been going stripping away our Constitutional rights, there wouldn’t be any of those after another four years. We would also be electing someone who we now know lies through his teeth, who takes money from some of the biggest corporate thieves in human history, and who has appointed some of those very criminals to most or all of the key economic policy positions in his administration. With Ron Paul as president, at least we’d be done with all the wars, the people of the rest of the world would be finally free of US military interference, including attacks by US drones. The long-suffering Constitution and its Bill of Rights would mean something again. We might even get a Supreme Court justice or two who actually believed that Congress should declare any future wars before we could fight them, and that citizens who were arrested had an absolute right to a speedy trial by a jury of peers. And we’d be electing someone who appears, especially for a politician, to be that rare thing: an honest man who says what he means and means what he says — and who doesn’t seem to be owned by the banksters. We’d have a hell of a fight on our hands in a Ron Paul presidency, defending Social Security and Medicare, promoting economic equality, fighting climate change and pollution, defending abortion rights and maybe fighting a resurgence of Jim Crow in some parts of the country, but at least we wouldn’t have to worry about being spied upon, beaten and arrested and then perhaps shipped off to Guantanamo for doing it. Ron Paul is now a phenomenon that has to be dealt with by both sides. The GOP is trying to keep the wheels from coming off in Iowa, and the DNC is wondering how substantial the threat to segments of their disillusioned base may be.